Ever See A 1-7/8 x 3 Inch View Camera? One of the lesser known view camera styles is the "side-strut" body pattern. Shew cameras are the embodiment of this design. Side-strut cameras could be folded into a very thin form that easily fit into a vest or coat pocket. 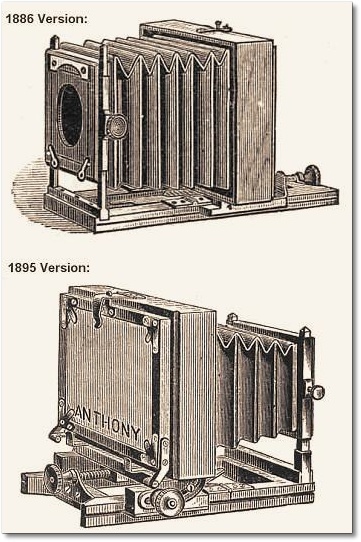 Shew first created the popular Eclipse side-strut cameras in 1885 based on George Lowdon's (Dundee, Scotland) 1885 patent. In 1894, Shew introduced Xit Pocket Cameras that eventually replaced the Eclipse series. Wood and brass were the most often used materials. Later models were also made with aluminum hardware. The cameras shown above represent two sizes of the same model. 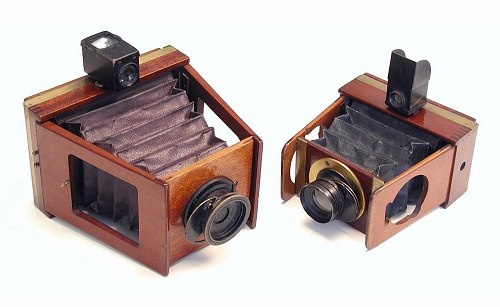 The larger (shown on the left) is a 1/4-plate (3-1/4 x 4-1/4 inch) format. It is made of highly polished mahogany and includes a coiled spring Shew Instantaneous shutter and Darlot lens. 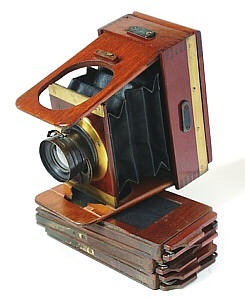 The smaller camera is an extremely rare and unusual 1-7/8 x 3 inch plate format. It makes the normally small 1/4-plate camera look large in comparison! It too is made of polished mahogany with brass bindings. The shutter is also a Shew, but uses spring-steel band to power the shutter. Established in 1849, J.F. Shew is believed to have been in business until 1920. His popular side-strut designs were also copied by French makers.